After you’ve been introduced to the fundamentals of Gottman Method Couples Therapy presented in Level 1 Training, the Level 2 Training will expand your assessment strategies and intervention techniques. This is the next step toward certification and designation as a Certified Gottman Therapist. 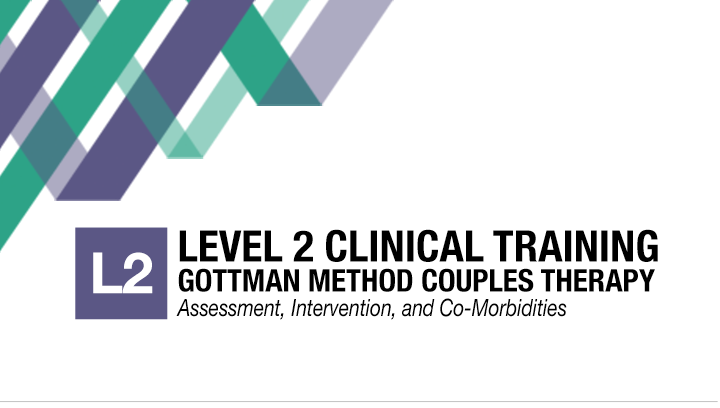 At the completion of Level 2 Training, you should have the clinical familiarity, knowledge, and resources to integrate Gottman Method Couples Therapy assessments and interventions into your clinical work. This workshop provides a wealth of information about relationship theory, observation, couple dynamics, relationship assessment, treatment planning, when and how to use interventions, and working with co-morbidities. All materials may be used in clinical settings. You will view original videos of couples from the famous Gottman “Love Lab,” as well as video of Drs. John and Julie Gottman demonstrating assessment and interventions in real case examples from their private practice. Live workshop participants will practice using the interventions in role play sessions to help gain confidence using them with couples. This training dives deep into the Gottman Method approach for treating complicated cases involving co-morbidities, including affairs, PTSD, addiction, and domestic violence. What will I learn in Level 2? Building on what you learned in the Level 1 Training you will review how to assess a couple’s Friendship Profile, Conflict Profile, and Shared Meaning Profile. You will be provided with a toolkit of interventions that couples can use as antidotes to the Four Horsemen and soothe physiological flooding. You will apply six modes of changing the Attack/Defend System in a couple’s interactions, and learn how to assist couples in establishing dialogue about their gridlocked conflicts. You will learn how to select and implement interventions to help couples deepen their Friendship System with rituals of connection, select and implement interventions to help couples create a shared system of values and meaning, and identify and implement five different co-morbidities common to couples using Gottman assessments and interventions. This training is for mental health providers, allied professionals and clergy, students and interns, family clinic staff, professors/teachers of couples therapy, researchers in the social sciences, and employee assistance professionals. Completion of Level 1 Training is required. Describe the three qualities every therapist needs. Explain the basics of observation including why it’s important to recognize Emotions on the Human Face, Tension in the Voice, the Importance of Words and the use of the SPAFF coding system. Describe how to recognize Bids and Turning Towards. Explain and demonstrate how to conduct an Oral History Interview. Explain and demonstrate how to use the 3 profiles to choose appropriate interventions for the couple. Describe the use of the core assessments with couples, including the Locke-Wallace, Weiss-Cerretto, Gottman Sound Relationship House Questionnaires, Gottman 19 Areas Checklist, EAQ, SCL-90, Detour Scales, CAGE, b-Mast, and Supplemental Assessments. Formulate a treatment plan and present it to the couple including using the Sound Relationship House model. Help couples to physiologically soothe when flooded. Select and implement interventions to help deal with conflict. Apply different modes of changing the “Attack/Defend System” in a couple’s interaction. Assist couples to establish dialogue about their gridlocked conflicts. Select and implement interventions to help couples deepen their “Friendship System” with Rituals of Connection. Select and implement interventions to help couples create a shared system of values and meaning. Use and describe the Stress-Reducing Conversation to minimize relapse. Identify and formulate a plan for different co-morbidities common to couples using Gottman Method Couples Therapy Assessment and Intervention. Describe how to apply Gottman Method Couples Therapy to a couple who has experienced an affair. Describe when it is appropriate and inappropriate to use Gottman Method Couples Therapy with a couple dealing with substance abuse. Describe the differences between situational and characterological domestic violence and when it is appropriate and inappropriate to use Gottman Method Couples Therapy with a couple dealing with domestic violence. If you cancel prior to three weeks before the workshop date, a full refund minus a $50 processing fee will be provided. Following the cut-off date, your fee can be applied to a future workshop. This training provides continuing education hours (CEs) for Licensed Marriage and Family Therapists (LMFT), Psychotherapists, Psychologists, Social Workers and other mental health professionals. Up to 20.25 CE hours are available through National Marriage Seminars and can be purchased for $40 prior to the event. Program Content Provided by the Gottman Institute. Licensing Boards change regulations often, and while we attempt to stay abreast of their most recent changes, if you have questions or concerns about this course meeting your specific board’s approval, we recommend you contact your board directly to obtain a ruling. Participants must attend the entire seminar and complete an evaluation to receive a certificate. Failure to sign in or out will result in forfeiture of credit for the entire course. No exceptions will be made. Partial credit is not available. Please let us know how we can serve you. If you require ADA accommodations please contact our office 30 days or more before the event.